Ideal for rooms of around 150 square feet. With HEPA filter, activated carbon filter and selectable ionizer. Ideal for rooms of around 300 square feet. With HEPA filter, activated carbon filter and selectable ionizer. Ideal for rooms of around 450 square feet. With HEPA filter, activated carbon filter and selectable ionizer. Replacement filter cassette for the Ideal AP15 Air Purifier. Replacement filter cassette for the Ideal AP30 Air Purifier. Replacement filter cassette for the Ideal AP45 Air Purifier. 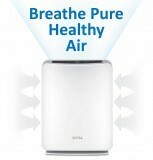 A professional air cleaner for hygienically pure air for rooms up to 400 square feet.